These gluten free and dairy free tortillas taste like wheat tortillas and won’t go soggy when baked in dishes like enchiladas. They taste great and are easy to make. The recipe below makes 9 – 10 tortillas but you can also mix the dry ingredients together in a large batch and store in a sealed container. When you want a tortilla, combine the dry mix with water at a ration of about 2:1, adding water by the tablespoon if needed. In other words, one cup of dry ingredients and 1/2 cup water will make 4 four-inch tortillas, 1/2 cup dry ingredients and 1/4 cup water will make two! TIP: If you find yourself missing a good ol’ peanut butter sandwich, try slathering a tablespoon or two of your favorite peanut butter onto one of these. Amazing! OR Try one wrapped around a hotdog for a great summer treat. TIP: For thinner and more pliable tortillas, add 1/2 cup mashed potato or mashed sweet potato. The tortilla in the photo has 1/2 cup mashed potato added, and we tend to make them this way all the time now. A big THANKS to Fitness, Food, and Feeling Good for the suggestion! We love it when people make our recipes even better! Heat the oil on a griddle set at 350 degrees or in a pan on medium high heat. Make a well in the flour mixture and add the water. Mix with your hands until well blended. Divide into 9 or 10 balls. Place balls one at a time into a tortilla press and flatten to make a 6 inch tortilla OR using a rolling pin, roll between 2 pieces of plastic wrap or parchment paper. TIP: To make a thinner tortilla, “triple press” it. After pressing, rotate the tortilla twice and repress after each rotation. Use parchment paper on your press if the dough sticks. Put the tortillas on your hot griddle and cook for one or two minutes or until the dough puffs up slightly and develops nice brown spots on the bottom. Flip and cook the second side. Tortillas made with mashed potato will take a bit longer to cook through. Cover to keep warm until you are finished cooking all the tortillas. Now fill with your favorite filling and enjoy! Don’t forget to follow our blog for our latest recipes (see the left hand side of your screen). OR LIKE us on facebook for 2 to 3 gluten free recipes delivered to your newsfeed every week. This entry was posted in Baking, Breakfast & Brunch, Lunch and Dinner, Recipes and tagged bread, dairy free, gluten free, potato flour, tortilla press, vegan. Bookmark the permalink. I’m going to try these, sound like a good alternative to wheat tortilla. Thanks. Let me know what you think. I can’t wait to try these….a dear friend of mine in gluten-free and I’m always looking for gluten free recipes to surprise her with! Thanks. She’ll love them, I’m sure. Let me know how they turn out. Enchiladas, yum….It’s been forever. Must make now. Thank you! “If you find yourself missing a good ol’ peanut butter sandwich, try slathering a tablespoon or two of your favorite peanut butter onto one of these”… sounds like my cuppa tea!!! Enjoy! Thanks for dropping by. I cant wait to try these! 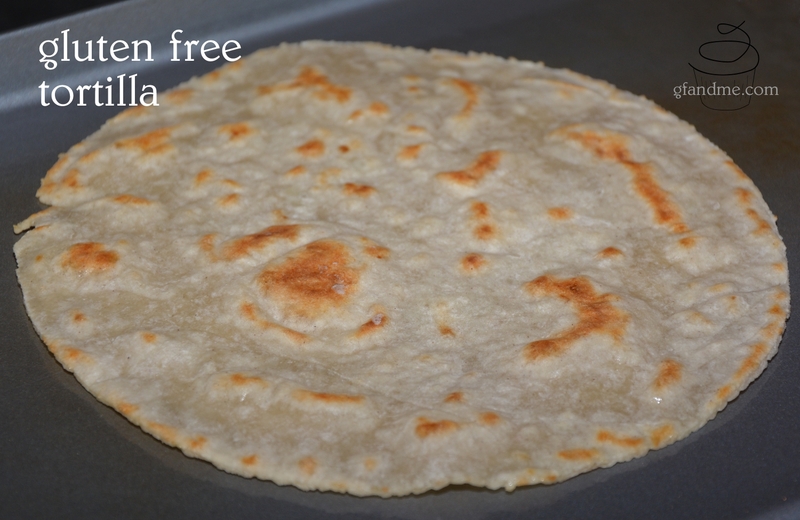 I have been looking for a good alternative for wheat tortillas, sounds like this is it! Hope you enjoy them. I know we love them. Thanks for stopping by my blog;) Can’t wait to check yours out since I have Celiac. Thank you for putting all the details in your recipe. Cooking for our gluten-free family members is challenging. Great blog. I’m so glad I stopped by. Oh Thank Goodness….I was just looking for this kind of recipe today! So glad I stumbled here thanks to one of your “likes” on my page. Spreading the Gluten free wealth around:) Thank you! Oo, exciting! I shall be using your blog for tips as I am a baker and am trying to offer tastier gluten free options for the customers where I work. Hi! Thanks for dropping by! For commercial applications, we recommend the almond flour raspberry muffins, carrot cake, any cookies, the trimble cake, and coconut delight – mainly because they all have ‘staying power’ and don’t go dry and stale within a day like much GF food does. The chocolate cakes and banana bread are great too, but there are lots of those on offer already. Keep watching because we are planning on posting an incredible biscuit recipe and my mom’s awesome pie dough recipe soon! Thanks for the advice. I’m off today to bake again so I’ll let you know which I get round to making. Is there anything I could substitute the corn flour with? I’m allergic to corn! Thanks. The corn starch is there to make them a bit lighter. I would try doubling the tapioca or else using rice flour. I’d stay away from the bean flours because I think their taste would overpower everything else. Let me know how they turn out! Thank you. I look forward to trying these! Sorry, forgot to say that you could also try these tortillas No corn listed in the ingredients. I agree with you on the brown rice tortillas! I would try substituting rice flour for the sorghum and maybe add more corn starch to replace the tapioca (or half rice/half corn for the tapioca). Adding more potato flour will make them very gooey, I think. All purpose would work, but there’s not much in these to mask the taste if you don’t like it. Thanks so much! Yes, gf cooking starts with a steep learning curve. Let me know how it goes! I LOVE finding new gluten free sites and ideas. Your tortillas look easy and so yummy!! I saw some almond flour raspberry muffins of yours too. I’ll be checking out more of your recipes 🙂 I can always use new ideas. A blog well-done! Thanks so much! The almond muffins are FANTASTIC! Thanks for stopping by my blog 🙂 I’m LOVING your GF recipes. I’m always looking for new ideas! As I was perusing, I can’t wait to go back and read about the almond flour raspberry muffins. These tortillas look easy and so yummy. Quick question: where do you buy your xanthan gum? We buy Kinnikinnik xanthan gum at a local bulk store called Nutters here in Central Alberta. I have seen it in grocery stores with well stocked gluten free sections. I believe Bob’s Redmill sells it as well. Hope that helps. This is really good – we’ve tried making corn tortillas twice and with very little success. Will give this one a go next time as we’d prefer to make our own. Thanks. Let us know what you think! Just a suggestion for corn tortillas–make sure that you’re using masa flour (check that it’s been treated with lime (calcium hydroxide). Thanks so much. These sound fantastic. Thanks so much for the reblog! Your recipe sounds terrific! Is it potato flour or potato starch? I used potato starch and they are too wet to make into tortillas. What can I add to dry it out??? What is ‘GF baking powder’? also, you mention ‘heating up the oil in the griddle’ and then cooking them which will make them very greasy. Do you know how these cook if you just use a hot cast iron griddle which is what is used when cooking traditional wheat & corn tortillas? Hi Hervey. By GF baking powder I mean not cross contaminated. If you or someone you are cooking for is highly sensitive to gluten, you may want to purchase baking powder that is labelled gluten free. I don’t find the tortillas greasy but I do like the idea of using a well-seasoned cast iron pan. I just don’t have one 🙂 If you try it please let me know how it works so that I can update the post and let readers know of a healthier way to make these. Thanks for reading.